Sketches by Dr. M. F. Quesnoy dated January 1855, drawn in the French camp and publishsed by L'Illustration, Journal Universel (no 624) 12 Fevrier 1855. He publishsed his memoirs in 1858. That, under the conditions where we are, our soldiers are perfect heroes, perfectly gay, would be too great an exaggeration, but I can assure you, however, they have all the gaiety and enthusiasm that they can in the circumstances. The good words [bon mots], the jokes are not entirely prohibited, and in the French soldier is like the thermometer of his moral state.But we must admit, it is far from our camp to look sorry at this moment: in movement, it offers animation in the good day [beaux jours]. Our tents are half hidden in the snow, and the small shelters of our soldiers seem more than points on the surface of the ground, and smoke floats away agaisnt the bluish gray of the sky. 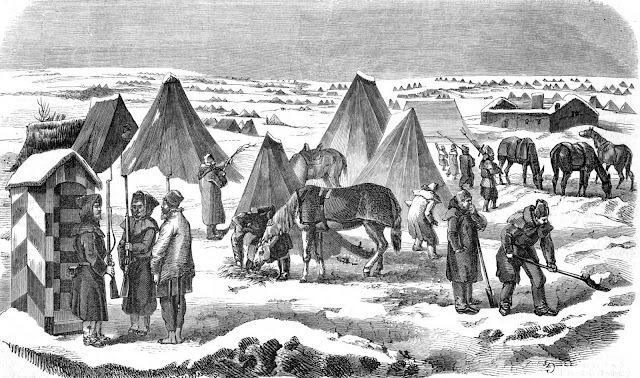 This is because wood is scarce on our poor plateau [of the]Chersonese, and that to pick up a few small bundles of twigs our men use almost a whole day. Apart from the need for movement and work, each [soldier] remains in his tent; side by side our troops warm thenselves. The homeland, and countrymen, are the subject of every conversation, and these memories, they always find a consolation, a hope, a pleasure. It is the very sweet memories of home in these sad days, and we gladly let go all the sadness when we [are] so inspired [and with] good food and wine or brandy [eau-de-vie]. Our soldiers have also received of winter clothing that completely transforms our army. Coats and leggings under the sheepskin wrapping that they look like Samojedes or Eskimos pares against a cold 40 degrees. Clogs and slippers when they will arrive, complete this mountain-man outfit. The hooded-greatcoats [caban a capuchan aka Crimeenes. ALD] were greeted with enthusiasm. They are warm, very ample, they are not only a warm clothing, but they hide the ragged pants of those who spend eight months of the campaign in them, and even if the the winter was not come, decency would have made ​​a duty to cover with clothing.And sheltered under [three layers of] garment[s], our soldiers did not suffer too much from the rigors of a season. Cavalry Officers as drawn and described by Dr. Quesnoy. 1. Officer of Hussars "wearing a long pelisse, a large Turkish sash, regimentally-coloured trousers, yellow ankle boots trimmed with fur." 2. "Wearing a Bulgarian fur cap, a hooded greatcoat trimmed with fox fur, held together around the middle by faun coloured leather belt; and around the neck an enormous red sash." 3. "A Marechal de Logis. Bulgarian cap in grey fur; a sheepksin jerkin worn over a long regulation greatcoat, sheepskin leggings with the fleece innermost; clogs." 4. "Officer of Chasseurs d'Afrique. Regulation Spencer, Turkish Fez, semi-rigid knee boots." 5. "Bonnet de Police; regulation greatcoat worn over a sheepskin jerkin, with the fleece innermost." 1. 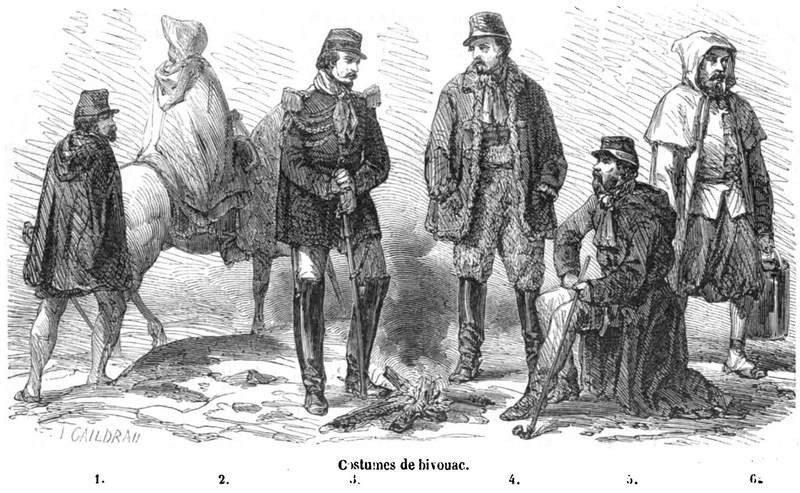 "Officer of Chasseurs a Pied. Rubber cape; long grey waterproof gaiters with buttons." 2. "Chasseur d'Afrique. Sky blue hooded great coat; white burnous; sheepksin leggings with fleece innermost." 3. "Staff Officer (Officier d'Etat Major) Short dark blue sailor's Patelot with regulation buttons, epaulettes and aiguilette; uniform trousers; tall, stiff knee-boots." 4. "Officier d'Ordonnance d'un General: Jacket of black fox fur; goatskin hunting apron [tablier de chasse]; knee length boots." 5. "Staff Officer. Large blue hooded overcoat, .long boots under the regulation trousers a la Louis XIII." 6. "Tirailleur Algerien. 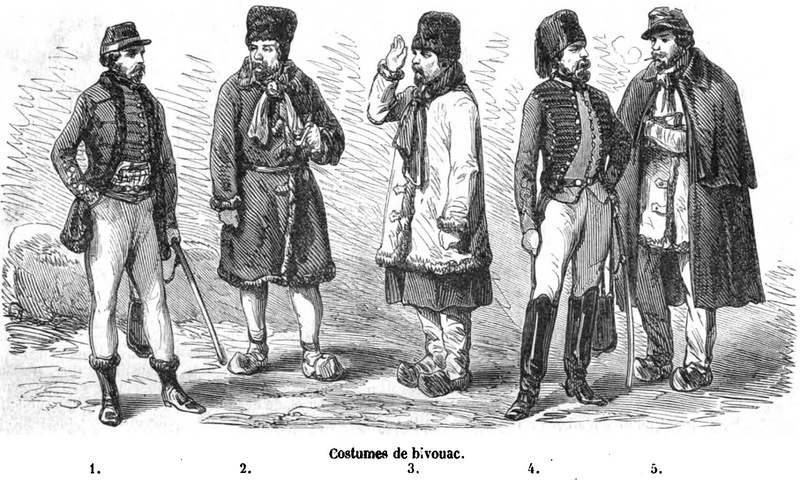 Tenue de Corvee. Sky blue hooded greatcoat; small sky blue hooded jacket fastened in place with a sash; regulations trousers and gaiters."